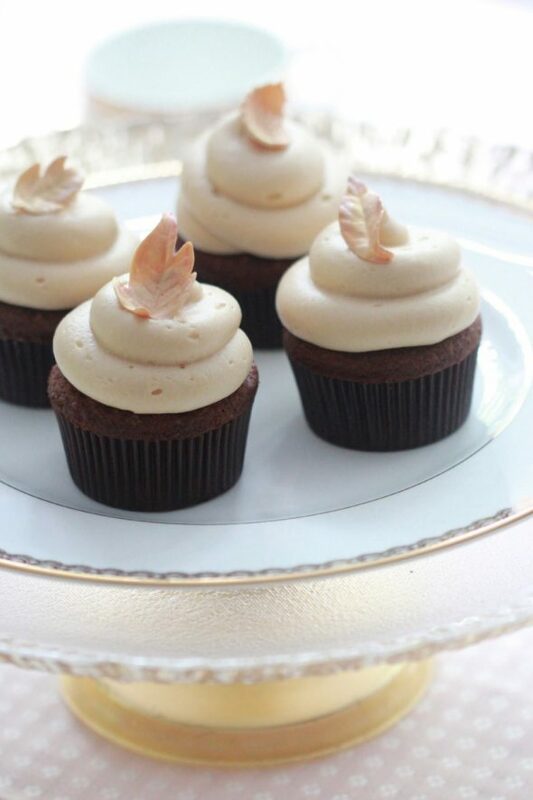 I have to say, these cupcakes have been a long time in coming – not that I haven’t made them – I just haven’t spent the time to make the decorations to go on top of them, and I think by now you know I love to share recipes and sweet decorations. 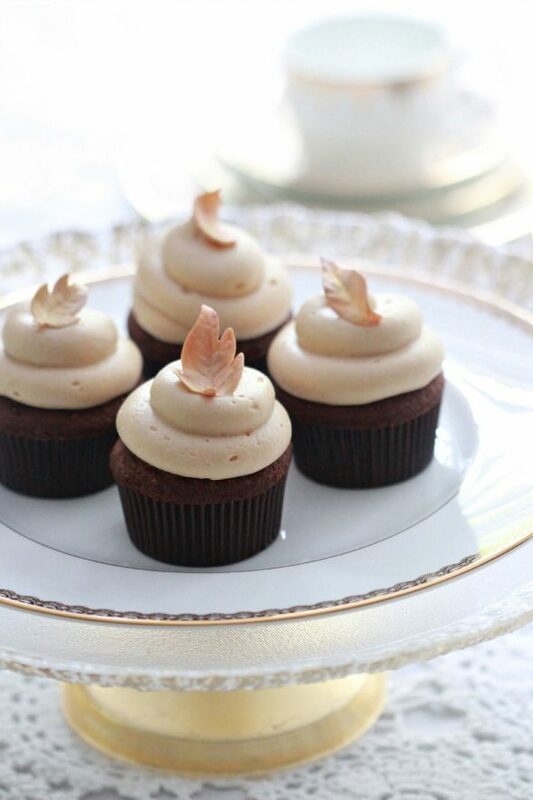 The cupcakes themselves are a caramel lover’s dream… rich, sweet, carmelized flavour paired with truffle-like chocolate cupcakes, with a liquid dulce de leche center. Needless to say I made a few for my husband and I and promptly gave the rest to our neighbours to prevent myself from helplessly overindulging. Making the leaves was a lot of fun (as only a baker or decorator can say I guess), was quite simple and really was very relaxing. Refaining from layering on more and more shiny petal dust was the hardest part – I ended up making and dusting way more leaves than I needed, but now have them for a future event I’m sure I’ll be able to use them for. What I love about the leaves is the many possible variations. If you make these, I’d definitely enjoy seeing your results. Please feel free to share your pics with me on social media or leave a comment below. If you’d like to decorate these in the same fall theme as pictured here, make the leaves at least one day ahead of use to allow them enough time to set. Recipes follow the gum paste leaf how-to. 2. luster dust in copper/gold/bronze etc. 10. flower formers or modeling forms (optional). 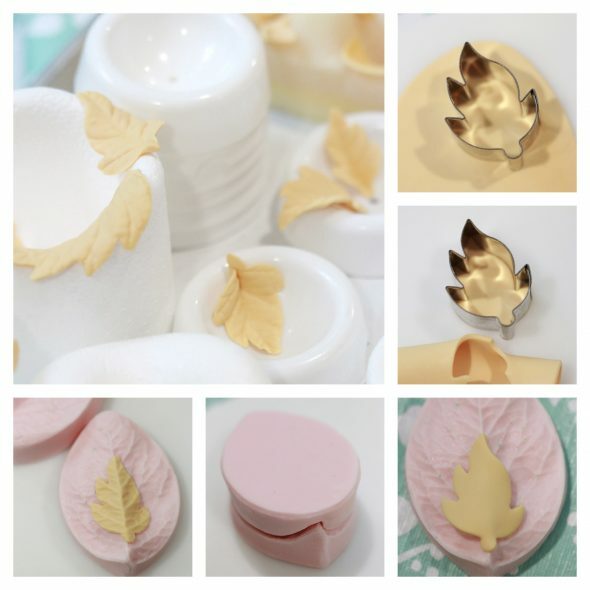 You can use any type of former to dry your gumpaste leaves in. A painter’s palette also works, as well as other inexpensive options such as egg cartons, egg create foam, aluminum foil, manicotti noodle trays or mattress foam. Knead your gum paste for a few minutes and massage a small amount of food gel coloring into your gum paste at a time. It’s easier to add coloring bit by bit, rather than trying to correct or lighten the color by adding more paste. I wear decorator gloves with a bit of shortening on them so that my hands stay color-free, and the gum doesn’t stick to them. Colors in gum paste tend to fade, especially blues, purples, blacks – deep colors essentially. It’s best to tint your paste and let it sit for 24 hours, so that you can see if you’re happy with how the color turns out. Dust your work surface with cornstarch. Knead the gum paste until smooth and pliable. 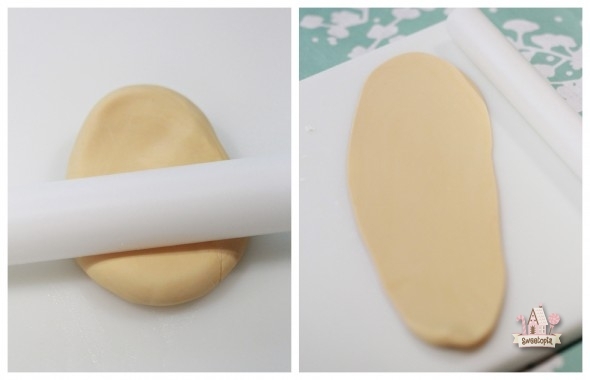 Place a small amount of gum paste on your surface and roll the gum paste out to about 3mm or 1/8 of an inch thick, using your small rolling pin. Press your leaf cutter into the gum paste, just as you would a cookie cutter into cookie dough. You can lift the cutter away, or pull the gum paste away from the cutter. Line up your leaf on the veiner – I usually put it on the raised half. Place the top half of the veiner over the leaf and apply pressure. Lift the top away and gently peel the leaf off the veiner. Place the leaf on your flower formers and let dry for 12-24 hours. How long it takes to dry will depend on the humidity in your area and how thick you’ve made your leaves. 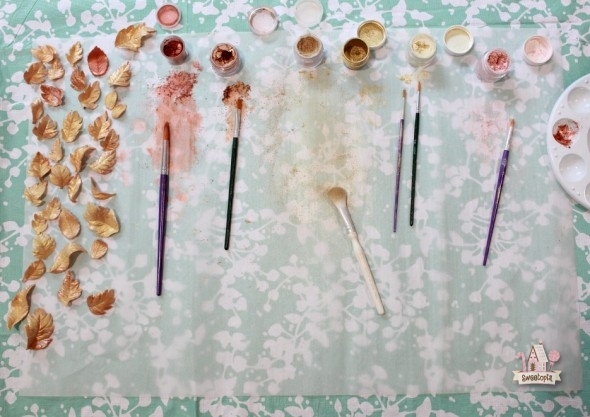 For a shiny fall effect, brush the leaves with petal dusts of your choice. 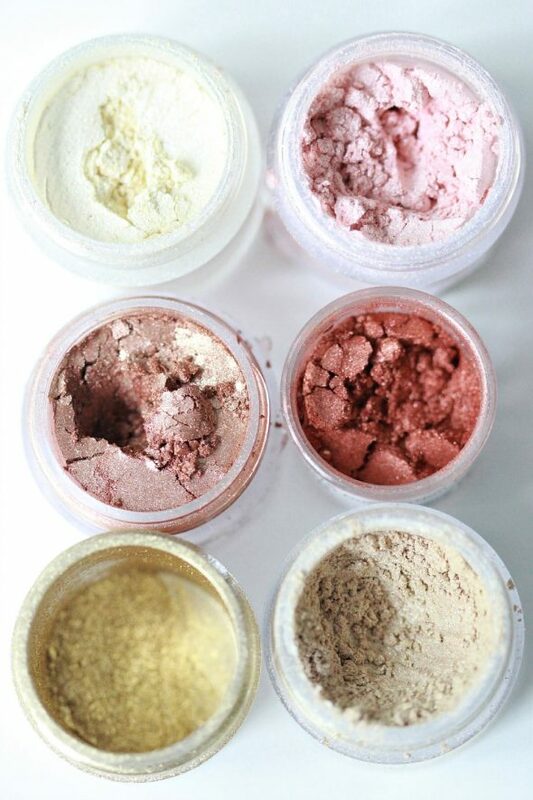 Torn between a bright, fall color palette or a gold/copper sparkly one, I turned to Instagram to ask your opinion – thanks for your responses! I ended up going with the goldish theme, with a little bit of pink and copper too. Take small amounts of petal or luster dust at a time, and place on a paper towel, painter’s palette or piece of parchment paper. It’s easier to control the amount of dust you put on your brush on the work surface, it’s perfect for catching the excess to reuse and is great for mixing colors. Gently brush the dust on your leaves in a circular motion. I used a larger, softer brush to place the gold on my leaves, as I wanted the majority of the leaves to look gold, and then used smaller brushes to add on the coppers and pink. Hold your leaves gently as they are delicate – the thinner you make them, the more delicate they’ll be. And that’s it! Easy gum paste flowers to dress up your cake, cupcakes or other confections. If you make extra and would like to keep them for a future event, make sure you store them in a box, nestled in bubble wrap or foam, in a cool, dry spot. The cocoa powder greatly affects the cupcake taste. Sift cocoa into a medium bowl. Slowly stir in the boiling water until smooth, then gradually whisk in milk. Set aside to cool. Whisk together flour, baking soda and salt in a bowl. In the bowl of an electric mixer fitted with the whisk attachment, or with an hand mixer on low speed, beat butter until fluffy; 3-5 minutes. Gradually beat in sugar, scraping down the sides of the bowl at least twice. Beat in the vanilla. Add eggs in 3 batches, beating well after each addition. With the mixer on low speed, add flour mixture and reserved cocoa mixture a little at a time in alternate batches, starting and ending with the flour; beat until just combined. Divide batter into the cupcake liners, 1/4 cup for each liner. Bake for approximately 12-15 minutes or longer - until a toothpick or skewer comes out clean. Time will vary according to your oven. Take cupcake out and when cooled for about 5-10 minutes, remove from pans. 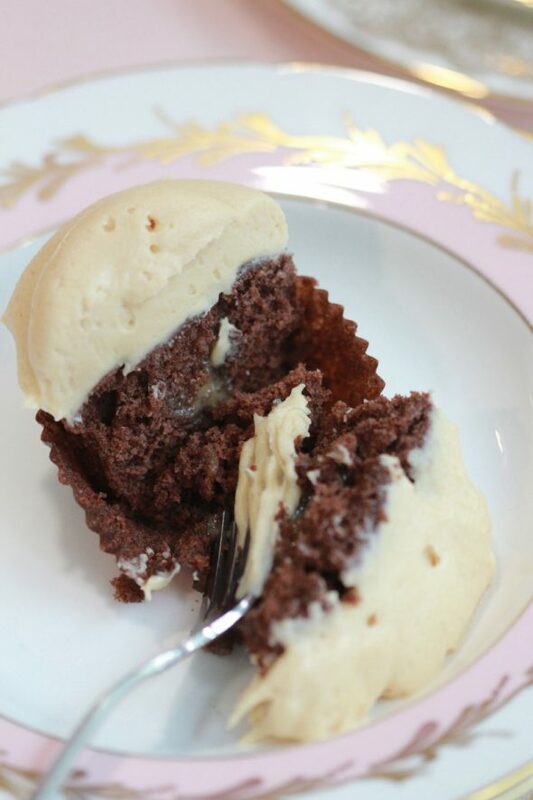 Let cool completely and cut out a small hole in the top, center of each cupcake and fill with chilled dulce de leche. I only filled mine a little bit as I find it doesn't need a lot paired with the caramel icing. 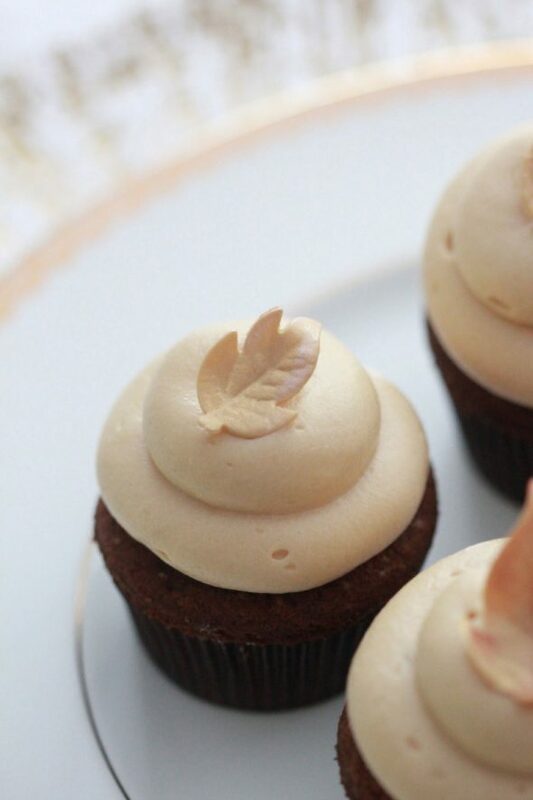 To finish, pipe caramel frosting onto cupcake with a large, round tip and place a gum paste leaf on top of the icing. **I used Eagle Brand dulce de leche, but you could make your own. Boil a can of sweetened condensed milk submerged in water for 3 hours. Make sure you top up the water if some evaporates away. See an example of this in the beginning of this video. Place the cream cheese in a mixing bowl fitted with a paddle attachment, and mix on low speed until smooth and creamy. Cream the butter and icing sugar in another mixing bowl until pale and fluffy. Slowly add the cream cheese to the butter mixture and mix at medium-high speed until the frosting is combined. Add the dulce de leche and mix until well incorporated and smooth. Your frosting will be soft at this point. Chill in the refrigerator until set. Hee hee, they didn’t mind 🙂 Thanks for commenting – I appreciate you visiting me here… it’s been a long time now hasn’t it! 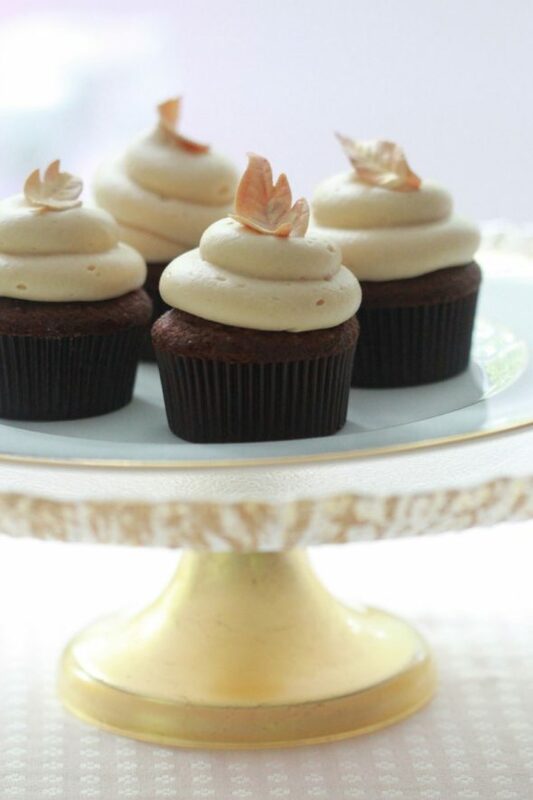 Love it…I can’t wait to try the caramel frosting recipe! Ohhhh Marian I love these little leaves!! I love caramel, I am sure I’d love the frosting. I would love to try a veganized version sometime! Thanks so much for sharing your tutorial. These little leaves all in one place, absolutely adorable! 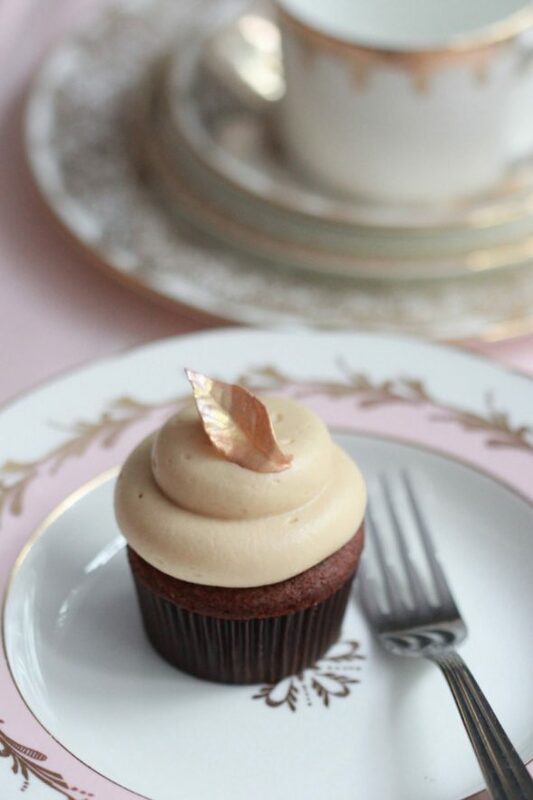 Beautiful finishing touch to a delicious looking cupcake! Great tutorial on making these lovely leaves. I love your choice of fall decorating cupcakes. The leaves are so real looking! Great tutorial! Great teacher! Thank you for sharing. Simply beautiful as always Marian! 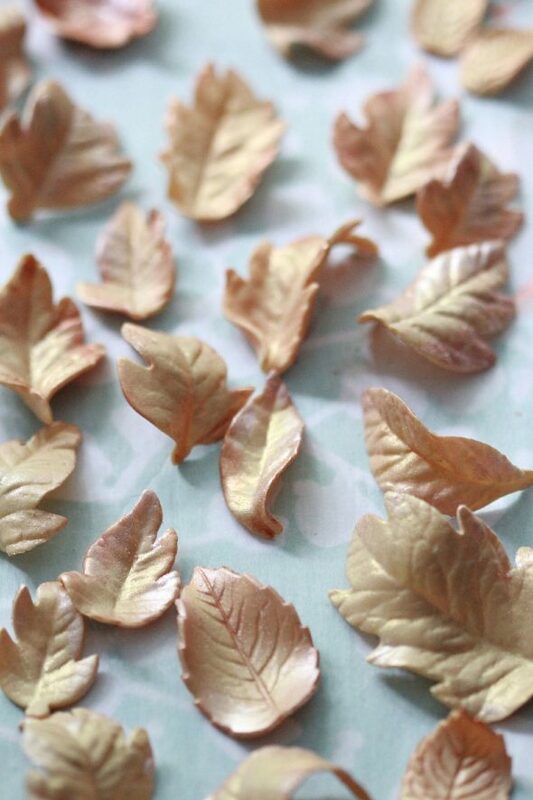 I need to try making those fabulous leaves – so pretty! This cupcake is so gorgeous! Loving the flavour! Love those delicate pretty little leaves. The colors are awesome and a perfect match for the caramel chocolate cupcakes! 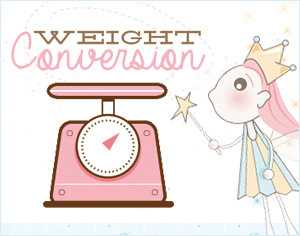 I have measurement conversion charts; you can find them by clicking on the measurement banner on the right hand side of the blog. This may sound silly… but are the leaves edible? Not at all Elizabeth! Yes, they are edible but they dry quite hard and i don’t find them amazingly delicious or anything. To me, they’re more of a food-safe decoration. What a yummy treat for fall! These are definitely going to be hit at seasonal gatherings. Thank you for sharing.